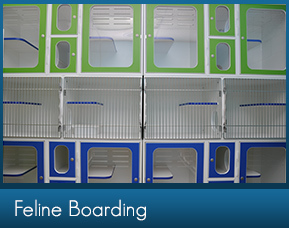 Separate, Stress-Free Boarding for Cats! Cats are treated like kings and queens at our Pet Hotel. 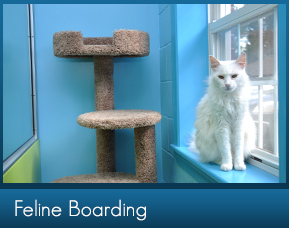 Cats get their own separate community in a quiet, stress free setting with spacious, individual accommodations. We provide a litter box and water bowl in each cattery. To top it all off, all cats get access to the state of the art climbing tree where they can stretch their legs and interact with our professional team members. You will have peace of mind when you have an upcoming trip knowing that our dedicated, professional staff will work hard to make sure your cat feels pampered while you are away. At Montrose Animal Hospital, our supervised boarding service includes a nutritional diet, multiple walks and cuddle time with our professional, loving staff. Owners who have cats with medical needs can be assured that their cat will be properly supervised by our staff. A veterinarian is in contact with our staff after hours and on weekends for cats that are boarding at our clinic. If your pet requires medication or treatment during their boarding stay, please inquire with the front office staff regarding any additional fees. In order to provide a relaxing stay for your cat, our staff collects as much information from you as possible, such as medical needs, activity level, feeding frequency and amount as well as your cat’s favorite petting spots! We understand that each cat is unique and we strive to care for each cat individually. For your cat’s protection, all cats that board with us must be current on vaccinations and free of internal and external parasites. Our staff takes pride in caring for your precious cats while you are away by providing a quiet, stress-free, clean, safe, and loving environment. 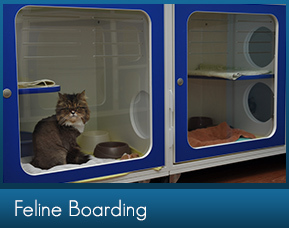 Our staff is trained to carefully monitor your cat’s health, safety and well-being while boarding. 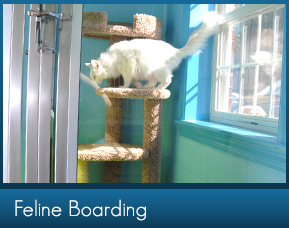 Our Pet Hotel is full of happy cats during the holidays so please book your cat’s stay with us as early as you can. Our Kitty Suites provide a variety of options, spaces and amenities to impress even those with the most discerning of taste. Ask about our 1,2,3 & 4 room suites. We understand that cats are very particular about their environment so we provide them with plenty of amenities and attention to keep them comfortable during their stay at the Pet Hotel. Whether it's sunbathing, a welcoming head massage or just needing a nice long stretch, our Play Time Towers offer the perfect space for your kitty to feel like a VIP in our stress free environment.